So many events are #HappeningInSolaire this November! Makes sure to catch John Ford Coley's Love Over Load Asia Concert tomorrow, November 13 as proceeds of the concert will be donated to Cebu/Bohol quake and Typhoon Yolanda victims. On November 20, catch the Asia's Nightingale, Ms. Lani Misalucha in her Queen of the Night concert. While on the 24th, have the Ultimate Viewing experience and see the Pacquiao vs. Rios fight. 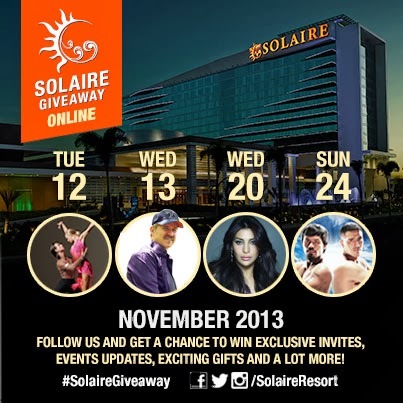 Aside from these events, catch the Solaire Giveaway for this month. The Peugeots and Millions Giveaway is ongoing where you can win every Fridays and Saturdays.